Fabric covered buttons, originally uploaded by the workroom. I bought my first button press about eight years ago. 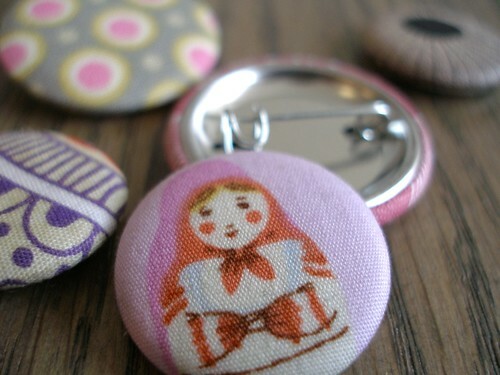 I had visions of making buttons from everything around me – postage stamps, newspaper classifieds, doodles and FABRIC. It was a disappointing moment when I realized that the button press always tore or stretched the fabric. It didn’t stop me from making thousands of buttons from everything else, but it was always a sore spot that fabric was not an option. How excited was I to read this post on WhipUp today about this tutorial that shows an ingenuous way to make covering buttons with fabric work. It’s absolutely brilliant! This could pose a serious problem for scrap-hoarders, it makes a mere 1.5″ round piece of scrap worth holding onto. angelune – Interfacing might work too. I just used some sticker labels I already had, and it worked perfectly. Johanna – You know you LOVE finding more ways to thrift every last inch of fabric! Hi I tried clicking in the tuturial but flicker tells me that “Oops! You don’t have permission to view this page”. Am I doing something wrong? I just read up on this, i knew you posted it awhile ago. thanks for sharing that tutorial karyn!!!! where can i get one and for how much?! Hi Suz – Oh no! I didn’t realize the tutorial was gone. Basically she used a blank sticker label that you stick on the back of the circle of fabric. This makes it sturdy enough to go into the button maker. Perhaps I need to do my own tutorial for this!